With the ocean and the inlet both easily accessible, there are many water sports to explore in the Outer Banks. It felt like a hangover to wake up today. I rolled over and closed my eyes, groaning. It was barely 8 am and to do lists were already swirling in my head. This wasn’t an alcohol-induced situation, it was the effect of knowing today was the last day of vacation. So I took a deep breath and hopped out of bed. The optimistic side of me kicked in (probably because I could already smell coffee!) and I wasn’t going to have a pity party for myself when there was a full day ahead. BAM. Back at it. Maybe it’s just that I stayed up a little too late reading Stir, by Jessica Fechtor, sitting on the top balcony porch last night. 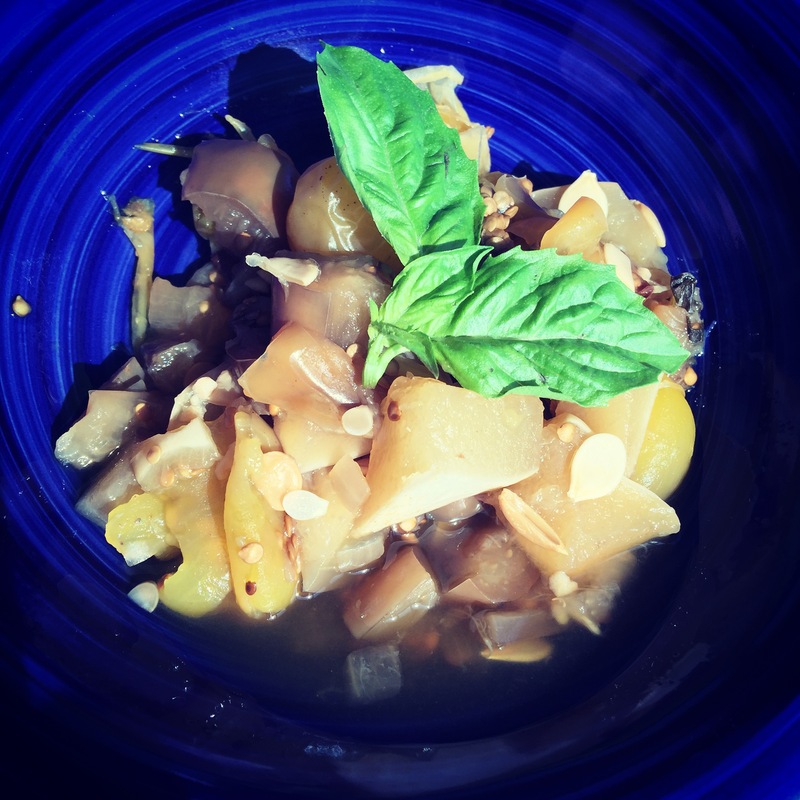 Thank you for joining Dinner Is A Crock on this Summer Series adventure! If this week of meals hasn’t inspired you to travel with your crock pot, or at least buy a crock pot, then I’m disappointed. Maybe you don’t want to cook every night when you are on vacation, but there is a reason you stay at a beach house and not a hotel– because you want the comforts of home, just in a different location. Next time you go on vacation, try cooking a few dinners all together, then sample the local fare at the restaurants the other days. If you want a maid and room service, you won’t find it here. But the blessings and freedom of beach house vacations promises adventure and whim instead of turned down sheets and sample-sized soaps. It’s a worthy trade off! This has been an amazing journey with you, fans. While I certainly got more of tan than you did, and probably a little more rest and relaxation, I hope you have enjoyed the adventure. 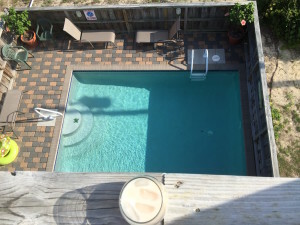 The beach house we stayed at in the Outer Banks, known as Ooh La La, is available for rental– with spaces still available this year and already booking for next! I cannot stress enough the ease of staying at this location. We’ve vacationed at other places on the coast and this is by far my favorite so far. I would like to publicly say thank you to the owners for letting Dinner Is a Crock share Ooh La La with the world! This one pot dish is literally named for being made in a pot. It’s the original one-dish cuisine. This, my friends. This is the quintessential dinner that melds together land and sea and balances the forces of nature to create an amazing meal that would make even mermaids and pirates cheer. With more protein than a Brazilian meat festival, this one pot recipe will make you lift your anchors and set full speed ahead toward the coast. And you’ll thank me for it. 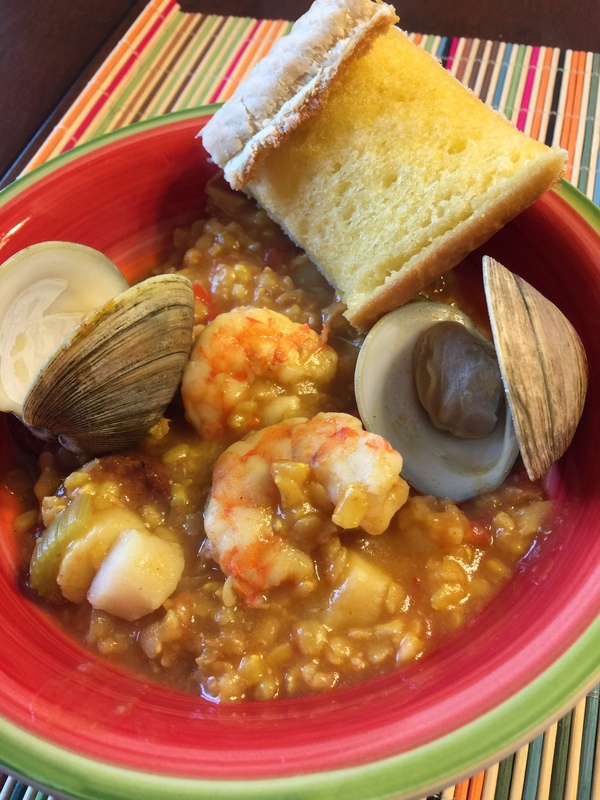 I thanked me for it– I’ve never made this dish before, but with so much fresh seafood available here in the Outer Banks, it was a challenge I was eager to attempt and declare victory for all. 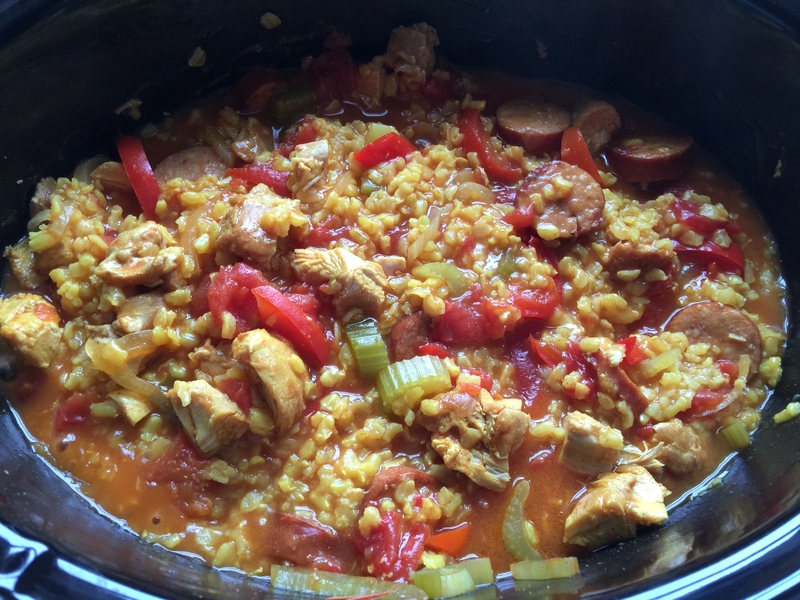 There are a few more steps than normal because of the complexity of textures in paella (pronounced PIE-Ay-uhhhh) so bear with me and I’ll try to break it down step by step so you can recreate this on your next seaside adventure. First, gather all of your ingredients. It’s helpful to know what goes in at what point so you can simplify your timing. 1. Brown your boneless, skinless chicken thighs over medium-high heat to get a quick sear on the outside. The chicken will have plenty of time to finish cooking the whole way through when it’s in the crock pot, but you want to seal in the flavor. After removing from heat, chop chicken into bite-size pieces. 2. Using the same skillet, brown the sliced andouille sausage quickly on both sides and remove from heat. 3. 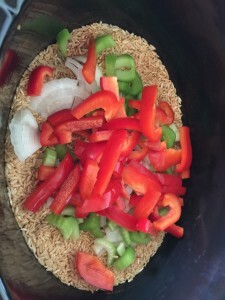 Put brown rice, seasonings, and fresh vegetables in the crock pot. Add broth and give it all a good stir. The turmeric and smoked paprika will flavor the entire dish but begins with this first step. Add bite-size pieces of chicken and cooked andouille sausage. Cook on low for six hours or until all liquid is absorbed. 4. After time is up, it’s ok to remove the crock pot lid at this point and give everything a really good stir. Try to keep rice from sticking to the bottom of the crock pot. Cook on high for up to one hour– shrimp should be pink and clams should have all opened. You do not want to overcook seafood so try to be nearby for this last step. Thank you to the owners of the Ooh La La beach house here in Avon. This dish used many of the tools and cooking accessories and your stocked kitchen did not disappoint. I had everything I needed to prep, clean and cook all of my ingredients for this meal. This kitchen set-up made everything easy, including a spacious dishwasher to handle my mess! 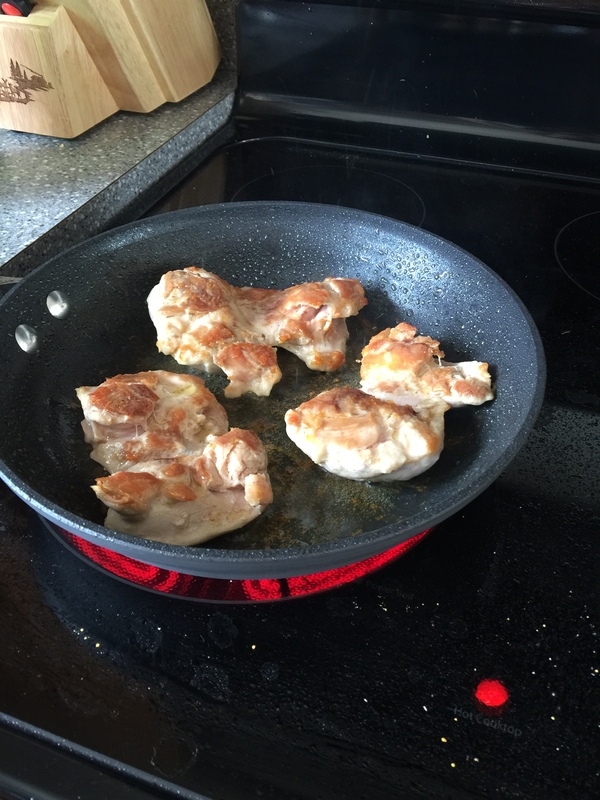 Brown your boneless, skinless chicken thighs over medium-high heat to get a quick sear on the outside. The chicken will have plenty of time to finish cooking the whole way through when it’s in the crock pot, but you want to seal in the flavor. After removing from heat, chop chicken into bite-size pieces. 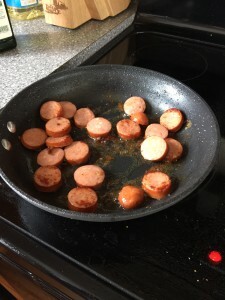 Using the same skillet, brown the sliced andouille sausage quickly on both sides and remove from heat. Put brown rice, seasonings, and fresh vegetables in the crock pot. Add broth and give it all a good stir. The turmeric and smoked paprika will flavor the entire dish but begins with this first step. Add bite-size pieces of chicken and cooked andouille sausage. Cook on low for six hours or until all liquid is absorbed. After time is up, it’s ok to remove the crock pot lid at this point and give everything a really good stir. Try to keep rice from sticking to the bottom of the crock pot. 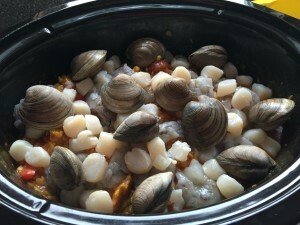 Add seafoods– shrimp, sea scallops and clams. Be sure to properly clean your seafood before adding to the pot. Cook on high for up to one hour– shrimp should be pink and clams should have all opened. I’m seriously considering moving to the beach. Sunshine, seafood, salty air… it’s all good for my soul. As long as I have a good internet connection, I might just be willing to carry my crock pots up and down the east coast and showcase local flavor and attractions. Ok, I’m putting it out there– where should I go next and who can hook a girl and her crock pots up?! I’ll feed you! I used the rest of my finds from this week’s farmer’s market to make ratatouille for dinner tonight. I love the fact that I used the same kinds of ingredients, but in a new way to make a totally different presentation! 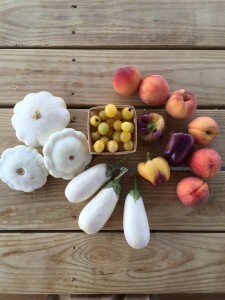 I have never seen pure white patapan squash or white eggplant before in this region, but I was delighted to experiment with these adaptations to the standard variety. I also used yellow cherry tomatoes instead of canned diced red ones. Such a delightful dish to cook low and slow while we played all day. While we normally do adventures as a family, today we decided to go in two directions– literally. My husband took our oldest to the beach to tiptoe in the shark-infested waters and fly a kite in the salty breeze. I took our youngest on a bike ride down the main road of the island. I’m so glad I bought a bike rack for my car so we could all bring our bikes to the beach. It’s so much easier than trying to rent them upon arrival! The sidewalks in Avon are flat and easy and the breeze felt fantastic even thought it was a scorching day. We all enjoyed the sunshine and a bit of solitude. There is something about experiencing the wind on your face and the sun on your back, just taking a deep breath and exhaling gratitude. I’m not kidding when I tell you that staying here in the Outer Banks has really been cathartic for all of us. But back to the food, of course! By the time we hit the beach, the bikes, came back to swim in the pool at the house, and got cleaned up… dinner was ready and no work was needed. Another amazing day is complete and it’s time to chill on the porch with a few cold drinks and listen to the birds and cicadas chirping in harmony. Mix all ingredients in crock pot and cook on low for 6-8 hours. Serve with rice, noodles or fresh bread and butter. If you can’t find patapan squash, you can substitute yellow squash. I might have found flirty peaches at the weekly Farmer’s Market this morning, but we still need to have dinner, right?! Good thing I decided to make a big ol’ batch of crock pot grits to cook low and slow all day. I mean, come on… it’s three ingredients. That’s barely even a recipe. So let me also tell you about the toppings I made for our grits bar tonight. 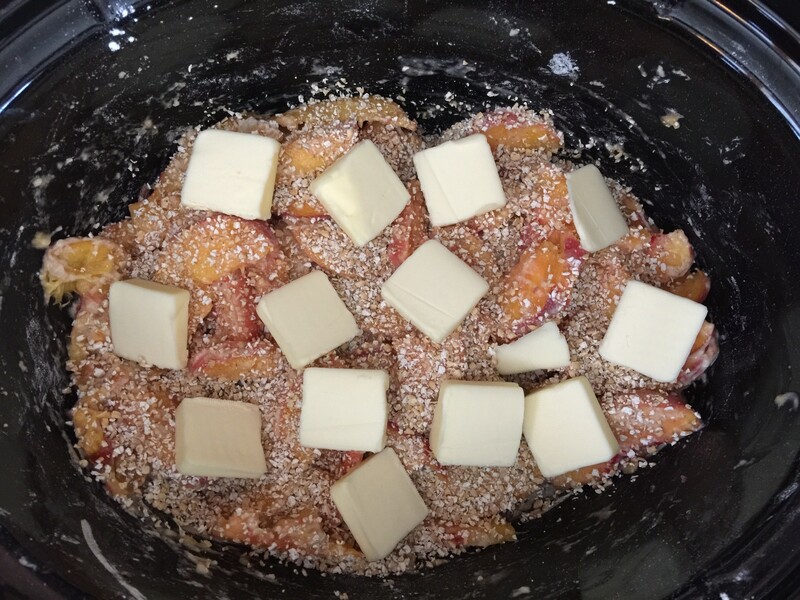 I like to make a simple crock pot of grits and then provide a buffet of toppings! After my morning adventure and an afternoon swim, I popped into the kitchen at Ooh La La, our beach house for the week, to whip up some easy toppings for our crock pot grits. Personally, I love a good dish of shrimp and grits with just the right balance of textures and a kick of spice, but not everyone is as big a fan of this southern specialty. So I’ve found that it’s better to make toppings and let people make their own concoction. 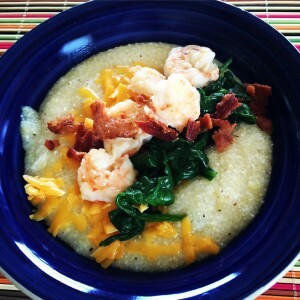 I have four tonight: 1. shrimp scampi 2. sauteed spinach 3. shredded cheddar cheese 4. maple syrup (but that last one stands alone for those people–AKA kids– that like their grits to be sweet instead of savory). Oh– and a couple adults added sriracha dribbles on top just to crank it up a notch! This worked out to be a great easy dinner before going to the luau tonight. The what?! Oh yes, there is a luau every Tuesday night at the Koru Village Resort and Spa. 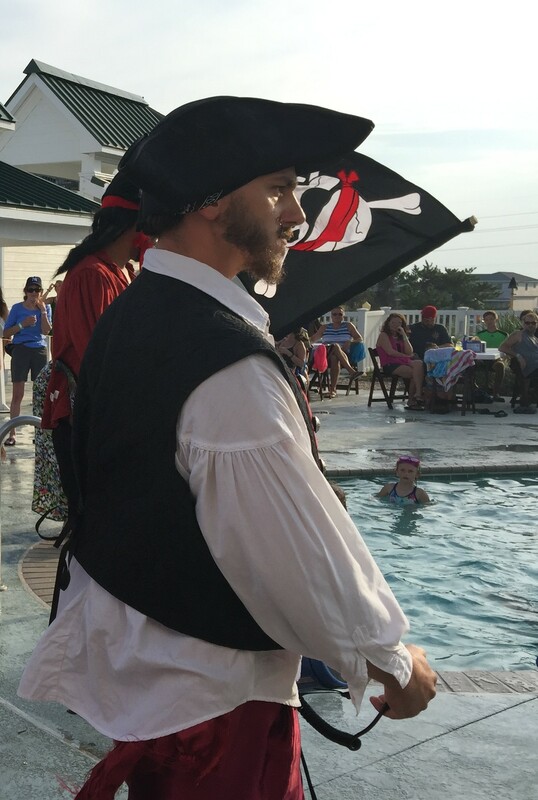 It was so much fun to have the kids swashbuckle with pirates, swim with mermaids and party with fire dancers! So here’s the quick recipe for tonight’s dinner. We shared it with the owners of Ooh La La, our beach house for the week. They are a fabulous local family that have really done an amazing job updating this vacation home! Since I’ve been blogging all week from here, I only thought it right to share some of my cooking! Even the baby enjoyed the grits, and there is nothing better than a gooey grits and toothless grin! Put all ingredients in crock pot and give it a good stir. Cook on low for 8 hours– it’s ok to stir it one or twice to make sure it cooks evenly. 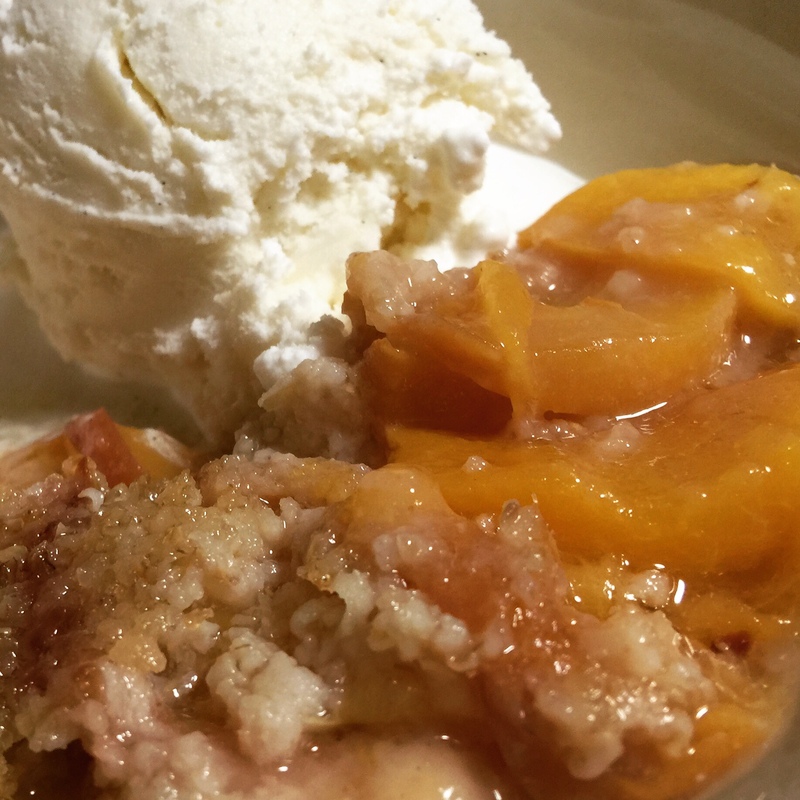 Local peaches from the Farmers Market produced this delicious and tender dessert for tonight! 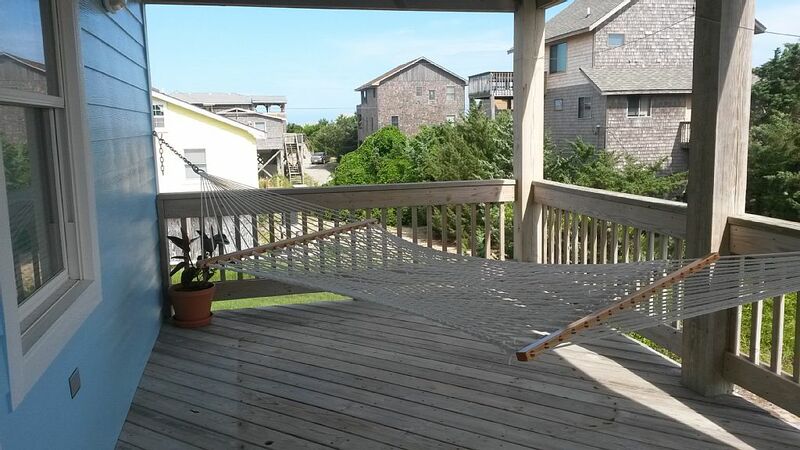 Another beautiful day here at Ooh La La, our beach house for the week in the Outer Banks, NC. I woke up early and decided to get out for a run since there are miles of sidewalks down the main road. It was damn hot out even at 8 am, but I managed my attempt to burn off some of last night’s dinner. 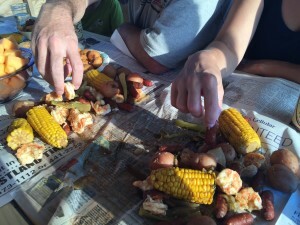 Remember that Crock Pot Low Country Boil? It was delicious but I was so full after all that food! The weekly Farmer’s Market here in Avon was more like a farm stand with a couple artists, but it was refreshing to see locals and travelers stopping by the support the event. Even in the heat, the produce looked fresh. 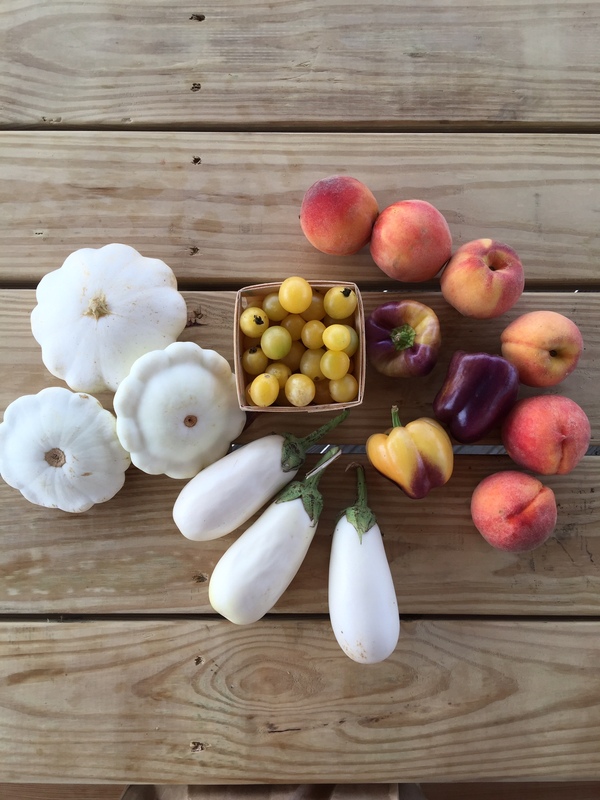 I brought back some interesting varieties of squash and eggplant that I’ll cook up later this week, but I also bought half a dozen glorious juicy peaches that were begging me to buy them. I couldn’t avoid eye contact. Such flirty little fruit. So I carefully selected my drupes and decided that dessert would be the next crock pot dish to make. You can make this recipe with lots of different fruits– peach, plums, blueberries, strawberries, blackberries… anything that is juicy and a good texture that will cook down. I wouldn’t recommend trying it with melons or apples since they consistency would be too soft or too hard. It was interesting coming up with this recipe today since I didn’t have my normal pantry to pick from, but this was a great way of using what I already brought and still making it work out. At home, I might have used flour and corn starch, but my boxed pancake mix worked just fine. You can eat this crumble straight up while it’s still warm. But those peaches are begging for some sweet company, so I would suggest serving it with ice cream or vanilla greek yogurt. If you want a little kick added to it, try pouring a drizzle of Rumchata on top of it for a really awesome finish. Looks like I might need another run tomorrow morning after I annihilate this dessert tonight! Good thing Ooh La La has a pool… an evening swim might just do the trick instead so I can sleep in. It’s a good thing we also brought our bicycles– I might try to take my kids out for a ride tomorrow. I thought it was going to be tough to haul all four bicycles, but my new bike rack actually worked out really well for the long trip. I talked to the owner today and she mentioned that the house is still available in September and October when it’s still hot here, but the tourist season slows down. It sounds like pure bliss to spend an autumn week down by the ocean with the hot days, but cooler nights. CLICK HERE and reserve your vacation before I beat you to it! 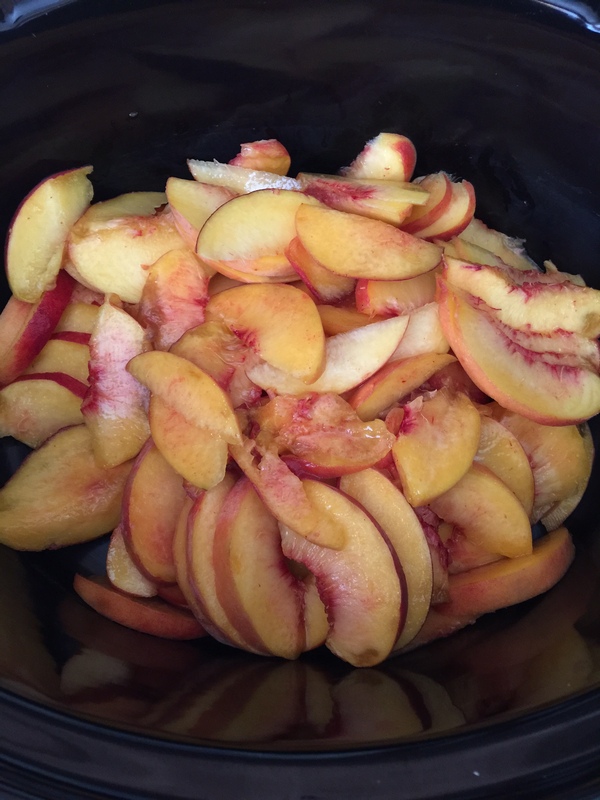 Put peaches in the crock pot and add maple syrup and pancake mix. Stir together until moist but not gooey. Sprinkle oats on top of mixture and then place cubes of butter across top. Cook on low for four hours. Serve with ice cream or greek yogurt. This meal requires no silverware– or plates! Dinner tonight was epic. Seriously. 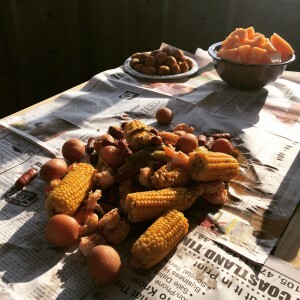 I’ve been dreaming about a low country boil for weeks now, but not just the flavors fusing together, but enjoying it with the salty ocean air, the sound of the waves, and the openness of a housetop porch. And indeed–my prophecy has come true! After another fabulous day at Ooh La La, our amazing beach house for the week, we enjoyed this one pot wonder just as the sun was setting. We started today at the Avon Pier, watching skilled fisherman catch buckets of fish and even some shark! Yes, the North Carolina coast has been ridden with shark incidents in recent weeks, but this was intentional baiting and catching of these dangerous creatures. No joke– it was thrilling and terrifying to see even little ones brought to the surface and hauled up to within feet of us. We attempted to go out for lunch today since dinner was already going and the pier really made us work up an appetite. Lunch was ok– but not the local fare I was hoping for; I’m not convinced that the “Catch of the Day” didn’t arrive frozen in a box the week before. The kids didn’t want to eat their fish sticks… because they didn’t taste like the ones at home (well, duh!). So while we all enjoyed the air conditioning and endless fountain beverages, I’m not convinced it was worth it to go out to eat. If the local restaurants aren’t appealing, make sure you stop by the local seafood markets instead– you can get fresh (never frozen) fish and creatures that came directly from the ocean. The Outer Banks is a prime location for tuna, soft-shelled crabs, shrimp, and many other options… including the sharks I mentioned before. It is totally worth the extra buck at the seafood market to have them peel and devein your shrimp instead! But if you do it yourself, click and buy the tool in the link provided! We then returned “home” for another afternoon of swimming. I peeled and deveined the pound of shrimp I picked up at the seafood market to add as the last step of the low country boil. Mental note to self– it is totally worth the up-charge to have someone else do this process. After removing the tubes of excrement from my crustaceans, I was no longer as excited to devour these treats of the sea. I mean, come on… I can’t unsee or unfeel that. But fresh is always the best option and local is a total perk. 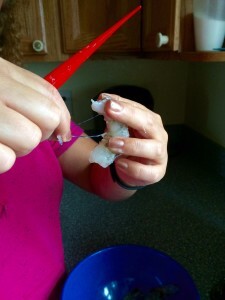 You’ll want your own shrimp tool to peel and devein in one swipe if you are getting fresh raw shrimp. The Crock Pot Low Country Boil requires a few extra steps than you normally see in Dinner Is A Crock recipes, but since we were in and out of the house all day, it was not challenging at all. Again– the point of taking my crock pot to the beach was so that we could eat well without interrupting our adventures. Dinner tonight was a total success and everyone ate well after our beautiful day in the Outer Banks. If you haven’t checked out the house yet, be sure to CLICK HERE and see about planning your trip to Ooh La La. 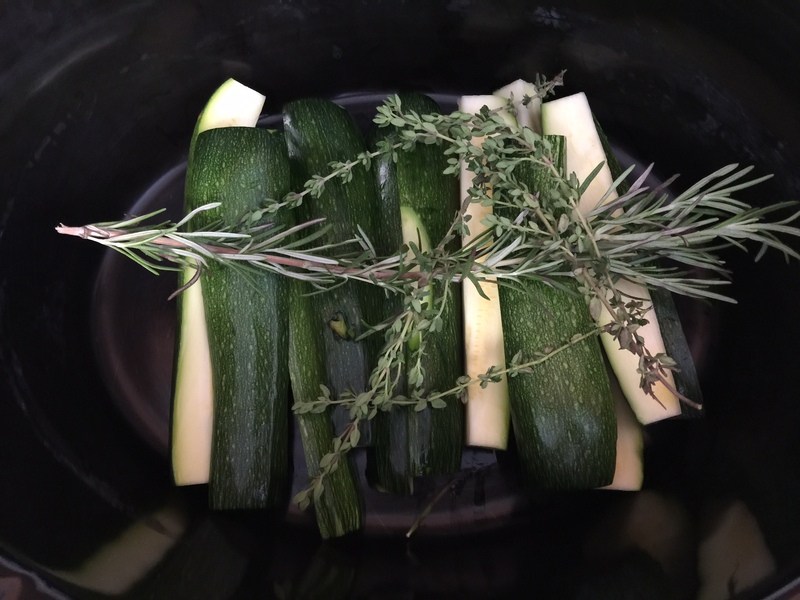 Put all of the vegetables in the crock pot with the water, seasonings and fresh dill. Add the beer. Cook on low for four hours or until the potatoes are fork tender. Add smokies or cocktail links and add another hour on low. Let the crock pot turn to the “keep warm” setting until you are close to dinner time. When ready, add the shrimp to the pot and set on high for 30 minutes– or just until the shrimp have turned pink. Drain crock pot into a strainer and shake out as much liquid as possible. Pour the steaming awesomeness directly onto a table (covered in a plastic bag and layers of newspaper) and enjoy with your fingers. No silverware or condiments necessary. 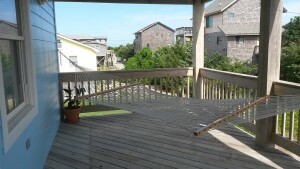 Roll out of bed and out onto the hammock as the sun rises and crests over the ocean and dunes. The sun was beaming in the window when I finally opened my eyes this morning. I had to look around for a minute and remember there wasn’t school or camp or work or anything to rush off to this morning. Today’s to do list included the pool and the beach. I was pretty sure I could accomplish those tasks so I rolled back off to sleep as the sun soared into the sky and the light in the room subdued. Granted, it was only another hour or so before my kids were knocking at the door and ready for breakfast, but I awoke again with a great calm and a readiness for an adventure. One thing doesn’t change no matter where I sleep– my desperate need for coffee in the morning. Lucky for me, Ooh La La‘s kitchen was totally equipped. Every appliance (COFFEE POT AND KEURIG!) needed was readily available and the cabinets were full of the comforts of home– not just dishes and cups, but tupperware, travel mugs, grill tools, fruit baskets. I was completely at home even though I was still uncaffeinated! After an easy breakfast, I skipped off to the grocery store, categorized list in hand. Oh, you missed that in the last post? HERE YOU GO. But whoa— I must warn you… the grocery store was full of crazy people without a plan. It was like playing Supermarket Sweep but with a Hunger Games approach. Despite my greatest organization, it still took longer than anticipated to get through the store, but the good news is that everything I needed was in stock. Since I brought all of my basics and non-perishables with me, I didn’t really need the aisles, just a lap around the perimeter of the store. Crock Pot Steamed Summer Vegetables are a great was to create a healthy and seasonal side dish. While I know that I’ll be at the local Farmer’s Market on Tuesday, I still needed some produce today. We were planning on a BBQ tonight with hamburgers and hot dogs, so I decided that I would steam some veggies in the crock pot as my side. The good news was that the store also had great little packages of fresh herbs and I totally stocked up. The groceries and prep work for dinner tonight took just over an hour and then it was off to the pool! The house seriously has it’s own swimming pool. I want to live here. Like, not just this week, but from here on out. The pool is just big enough for all the kids and grown ups to get in and play. The youngest played on the stairs mostly and the oldest kept trying to see if his cannonball could splash over the fence. Oh wait– you thought I meant my oldest kid? 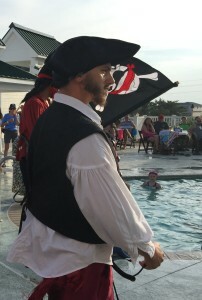 Nope, that was my husband trying to tsunami the pool! 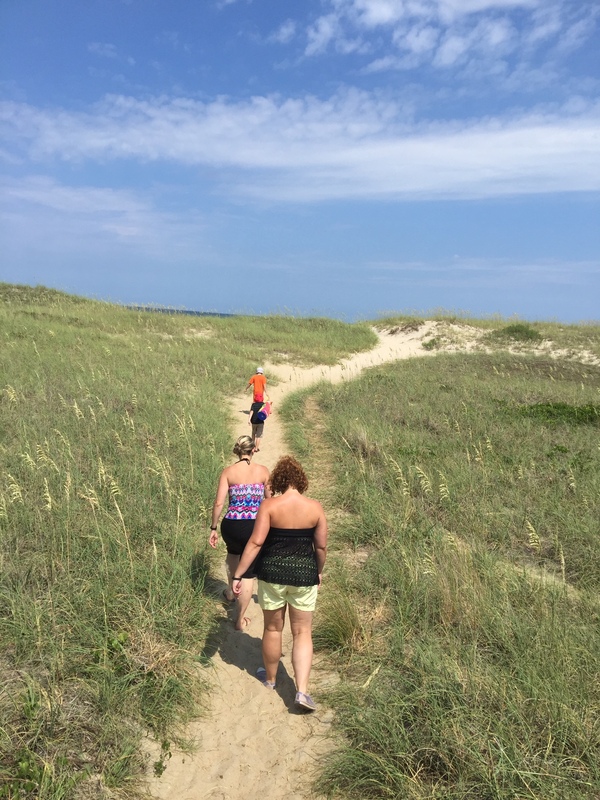 Sand dunes in the Outer Banks help protect these narrow islands from harsh weather. After the pool and a light lunch we crossed over the sand dunes to the beach. There is something about the waves that is so cathartic. I feel such peace at the waves, listening to them crash and then pull everything negative away. There is something that reaches my soul when I stand at the waves and realize I have to relinquish all control. I can’t make them stop. I can’t make them crash. I can’t protect my sand castle or demand that the water fill the mote. I can just breathe and trust that none of it is my handiwork and that the water will continue to rise and fall and I don’t have to do anything. Much like dinner tonight– there is nothing left to do but breathe and enjoy. Layer vegetables and fresh herbs in the crock pot so the flavors are infused throughout the dish. 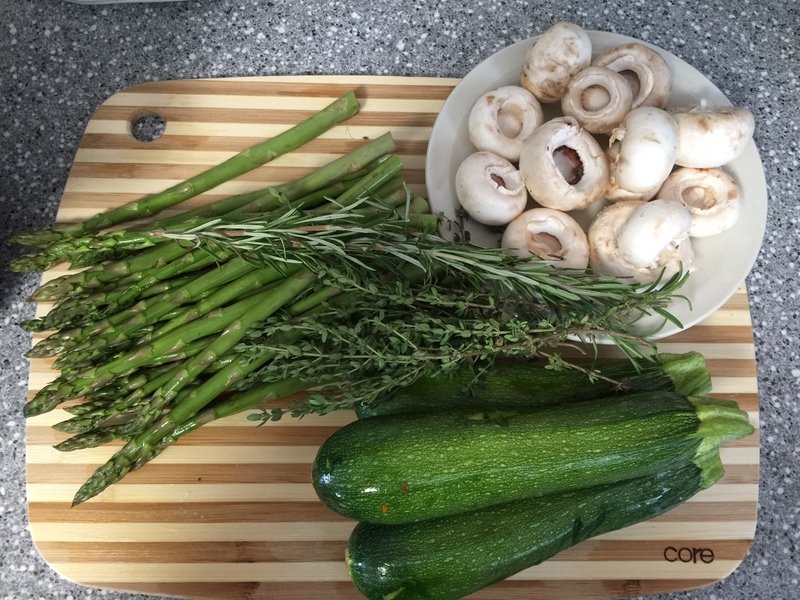 Layer vegetables and herbs in the crockpot– I put in zucchini first, then 2-3 sprigs thyme; add asparagus and a couple sprigs of rosemary; then the mushrooms and the remaining seasonings. Pour in the cup of water around the edges so that the water covers the bottom of the crock pot. The vegetables will release enough additional liquid to continue the cooking process. Cook on low for 4 hours, then serve. You can remove the herbs or use them as garnish. Summer Series: Dinner Is A Crock Heads To The Coast! We are going on vacation! 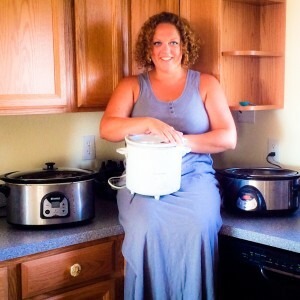 I am so excited to take you (and my crock pots) to the beach to enjoy some sunshine, crashing waves, relaxation and of course, delicious food. 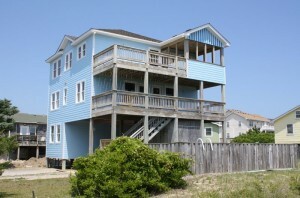 We have rented this amazing beach house located in Avon, North Carolina. 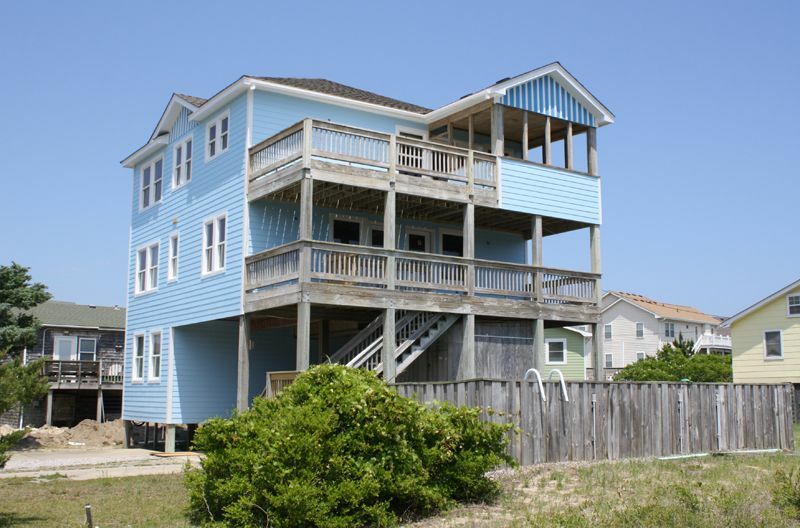 Avon is part of the Outer Banks, known for it’s quiet beaches, beautiful dunes, local seafood, and tons of adventures. And away we go!! I’ve got my laptop and crockpots and a couple bathing suits. What else could I need?! Home, sweet home– at least for this trip! Welcome to Ooh La La, our home for the next week. The house has recently been renovated and between the spacious bedrooms, totally updated kitchen, swimming pool and decks off every level, I’m pretty sure this is heaven. Or on the top deck, it certainly feels close! YOU can also vacation here, Ooh La La is listed on VRBO.COM and since it’s just renovated, you can still get here this summer or fall! Honestly, you’re best off booking this summer if you want to come next summer. I’m already starting to think about when we can come back… and we’ve only been here a few hours! It’s that awesome! We’ve got three adults and three kids here this week, but the house could easily handle 8-10 people. We are three houses from public beach access, a mile from the Avon Pier, and any store you need is off the main road in the next couple miles. If you’ve learned anything from me yet, you have realized I’m a planner. Slightly crazy. Not quite neurotic. But a great plan makes for a easy adventure. So first things first, I planned our meals. I want to have as much fun at the beach as possible, so I didn’t want to worry about what to cook and I also didn’t want to eat all of our meals out (that gets expensive!!). Once I planned our meals, I made lists– what to bring from home, what to get at the grocery store upon arrival, and then what kind of local/regional fare I wanted to get from seafood markets and farmers markets. I know it seems like a lot of work, but when I get there, the only thing I want to run out to get more of is sunscreen and beer! Here is my MEAL PLAN and GROCERY LISTS. (Click on the CAPPED words to open documents.) Think about adapting this for yourself when you go on a trip– what would make for easy breakfasts and lunches… where will you eat lunches? Will you eat them all together or on separate timelines? Can everyone get back together for dinner each night or how many of the nights? Does anyone have a good allergy to be aware of?! You can simplify your crazy by answering these easy questions and then bringing all your basics. Also– think about those basic items like condiments, cooking oils, seasonings, etc. You certainly don’t want to buy brand new ones of everything when you get to your destination unless you really need to do that. Just like you know you need towels and sheets, pack what you can to make settling into your destination as easy a transition as possible. 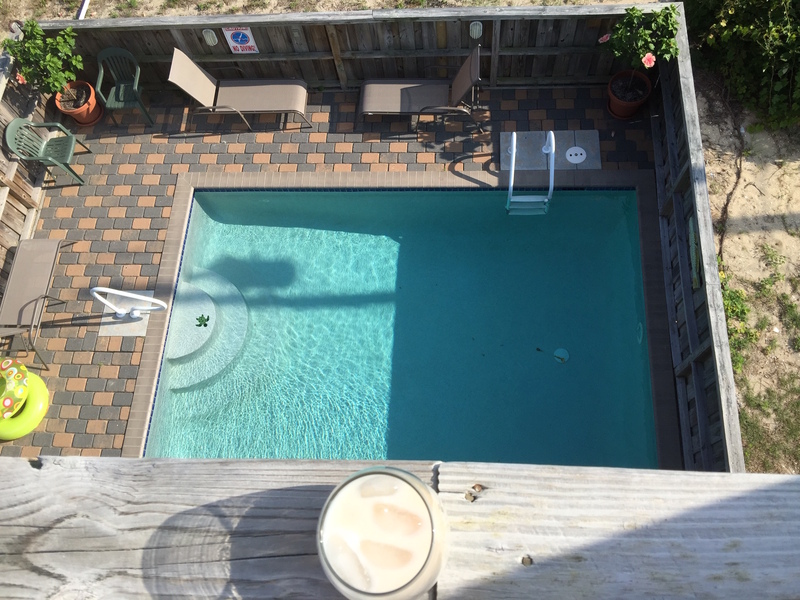 Our beach house for the week has a pool! And that little bit of prep work will make for an easy week. I can’t wait to share it all with you– check out Dinner Is A Crock on Facebook and Instagram for more pictures and stories! We just arrived and I’m already chilled… just like my drink. Cheers!